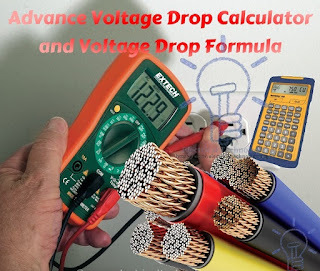 Advance Voltage Drop Calculator and Voltage Drop Formula. According to the NEC (National Electric Code) [210.19 A (1)] FPN number 4 and [215.2 A (3)] FPN number 2, the allowable Voltage drop for feeders is 3% and the acceptable voltage drop for final sub circuit and branch circuit is 5% for proper and efficient operation. Allowable Voltage Drop = 110 x (3/100) = 3.3V. We have already discussed the selection of proper size of cable for electrical wiring installation in SI and British system with examples. In the above article, we have also explained the voltage drop calculation and voltage drop formula and online cable size calculator. Today, we are going to share Online Advance Voltage Drop Calculator and Voltage Drop formulas in detail. Good to know: Read the full description below the voltage drop calculator for better explanation as there are many voltage drop calculation formulas with example. in addition, there is also a very simple method to calculate the voltage drop. Voltage Drop Formulas and Voltage Drop Calculation. VD = IR ……. (Ohm’s Law). VD = Voltage Drop in Volts. I = Current in Amperes. But this is not always the case, and we can’t run the wheel of the system with this basic formulaJ. This is the approximate voltage drop formula at unity power factor, cabal temperature 75˚C, and cable conductors in steel conduit. VD = (2xkxQxIxD) / cm for Single Phase. VD = (1.732xkxQxIxD) / cm for Three Phase. Cm = the cross sectional area of the conductor in circular mils. D = the one way distance in feet. I = the circuit current in amperes. Q = the ratio of AC resistance and DC resistance (RAC/R/DC) for conductor larger than 2/0 for skin effect. k = specific resistivity = 21.2 for Aluminum and 12.9 for Copper. Voltage Drop formula for Single Phase and DC Circuits. 1) When wire length is in feet. I = Wire Current in Amperes. R = Wire Resistance in Ohms (Ω) [Ω/kft]. L = wire distance in feet. 2) When Wire length is in meters. R = Wire Resistance in Ohms (Ω) [Ω/km]. L = wire distance in meters. Voltage Drop Calculation and formula for Three Phase system. For 3 Phase 3 Wire system. For 3 Phase 4 Wire systems. R = Wire Resistance in Ohms (Ω) [Ω/km or] or (Ω/kft). L = wire distance in meters or feet. An = cross sectional area of “n” gauge wire size in kcmil. kcmil = kilo circular mils. n = the number of gauge size. d = wire square diameter in in2. Wire cross sectional area in square inches (in2). An = cross sectional area of “n” gauge wire size in square inches (in2). d = wire square diameter in mm2. Where “n” is number of the gauge size and “d” the wire diameter in inches. dn = 0.127 × 92(36-n)/39 …. In millimeters (mm). Where “n” is number of the gauge size and “d” the wire diameter in mm. R = Resistance of the wire conductors (in Ω/kft). n = # of Gauge size. ρ = rho = resistivity in (Ω·m). An = the cross sectional area of n #gauge in square inches (in2). R = Resistance of the wire conductors (in Ω/km). An = the cross sectional area of n #gauge in square millimeters (mm2). Voltage at the End of the cable formula and calculation. VEnd = Supply voltage at the end of the cable. VD = Voltage Drop in the cable conductors. ρ = rho = specific resistivity in (Ω – circular mils/foot). L = wire length in feet. The voltage drop in copper conductors can be calculated via the below simple and easy formula with the help of the following table . f = factor from the table below. L = conductor length in feet (100 feet) . Example: Suppose, Voltage is 220V single phase, current is 5A, Conductor length is 100 feet, and Wire gauge (AWG) is #8. Calculate the voltage drop. Since the factor for #8 AWG conductor is 0.125 (from the above table). Now, putting the values in the above formula. VD = Voltage drop = 0.625V. P.S: The above voltage drop calculator provides approximate values and we do not guarantee of 100% accurate results as results may change with different and real cables, conductors, wires and different resistivity of material, number of strands in wire, temperature and weather condition, conduit and PVC etc .